Do architects have the power to make great buildings and better cities? As I speak to design professionals in Canada, the answer I hear is no. When it comes to the bulk of what we’re building – especially housing – they simply don’t have the influence. Her career of three decades in Britain suggests a lesson for design professionals: That fighting for the ideal building and city is their job, and sometimes they can even win. Brooks is about to open a new building, the Cohen Quadrangle, at Exeter College in Oxford, and is working on a major Vancouver housing project for the developers Rize. So far, her buildings are respectful of traditional urban design, sensitive to the city around them and are both beautiful and inventive. Brooks aims to pursue all of these values at the same time. During a recent April 12 talk at the Architect@Work conference in Toronto, she summarized her values in four words: authenticity, generosity, civicness and beauty. That creates particularly compelling results in the field of housing. That type of building is Brooks’s specialty and her firm has won all three of Britain’s top architecture awards for such work. Brooks presented some of her firm’s residential projects, which suggest how contemporary apartments – both for market housing and for social housing – can be humane, sensitive to their contexts and beautiful. Take Ely Court, a series of residential buildings that are part of the rebuilding of a postwar public housing estate in northwest London. Brooks’s team designed three four-storey blocks, containing 43 homes, as part of a larger rebuilding of the South Kilburn Estate that’s being run and owned by the local municipality. Originally this area was brick row houses, built by developers in the 1860s, and those blocks were torn up, beginning in the 1950s, for a complex arrangement of mostly mid-rise and high-rise apartments. Brooks’s work, in some respects, goes back to the 19th century. “The Victorians were excellent urban designers,” she says, and accordingly her three buildings rebuild the Victorian street grid, adding a new lane and street and facing squarely against those public ways. The architectural language is friendly to its older neighbours: Brooks has chosen a warm, light-brown brick that harmonizes with the London stock brick around it. And at four storeys, her buildings are similar to the older three-storey terraces; they also extend two-storey porticos out toward the street, and place balconies recessed within the face of the building, adding an attractively varied texture. On the other hand, there’s no effort here to mimic the details or even the precise forms of Victorian housing. These buildings are square, largely without ornament and they have the odd diagonal corners carved out for a bit of formal poetry. There’s nothing faux-old about this: It is unapologetically 21st-century architecture that recognizes the past. Of course Brooks is doing most of her work in the context of London, which boasts a wealth of architectural and urban history – and where responding to that history is both expected and required. “There are experts in planning and conservation and there’s an expectation of living up to the historic context,” Brooks says. Raised in Welland and Guelph, Ont., Brooks attended architecture school at the University of Waterloo. After graduation she moved directly to London, joining a group of fellow 1987 and 1988 Waterloo graduates in search of opportunity. “I went on a two-year working holiday and never came back,” she says with a smile. Brooks has dabbled in object-making herself. 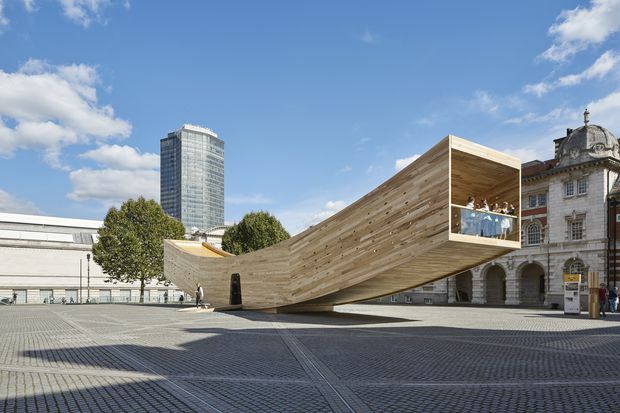 In 2016 she designed the Smile, a 34-metre long pavilion made of engineered wood that was shaped like, yes, a smile. It was a hit, much Instagrammed.